Thinkin just arrived from the farm she was raised on in Florida. She raced her entire career of 124 races at Orange Park in Florida. She was pretty good getting up to A level. She was retired from racing in May of 2017 and went back to the farm to become a mom. She was bred once but missed. 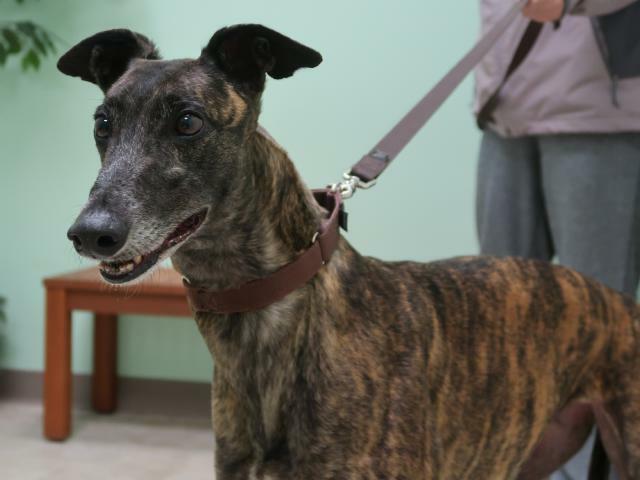 After the vote to end racing in Florida she was not re-bred, so never got to have any pups. Now she is officially retired from mom duties too. Thinkin's sire is the famous Fuzzys Cannon and her dam is CTW Anti Gravity. Thinkin is a very friendly, happy girl. She was very high energy when young but has calmed down some now that she is over 5 years old. She is still pretty active for a 5 year old greyhound. She rides well, crates well and is good on leash. She seemed to like the toddlers she met and was very gentle when greeting them. She was also fine with the small dog she was around. Thinkin was curious about the cat and followed it around and sniffed and sniffed it, but never tried to hurt it. The cat finally slapped Thinkin for sniffing too much and she wouldn't get near the cat again. Although overly curious at first, she should be very trainable with a confident cat. She is being fostered with cats and is doing very well with them. Thinkin is a very nice, outgoing girl that is going to be a great pet.